This Wolf-Rayet star has been found deep in our galaxy, and it's behaving in a way scientists didn't expect. A star that has been found deep in our galaxy is behaving in a most unusual way, and it could help scientists better understand the formation of spectacular Wolf-Rayet stars. 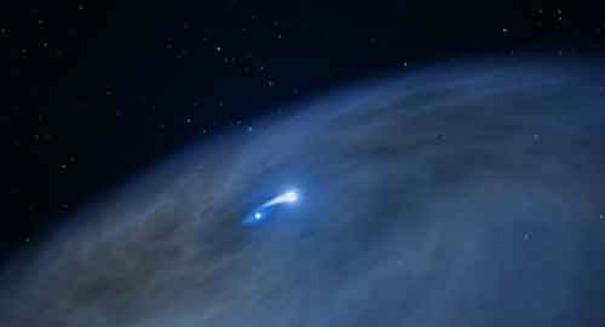 The star, called “Nasty 1,” named after its catalog name of NaSt1, was discovered 50 years ago and classified as a Wolf-Rayet star, which means that it is a huge star that sheds its outer layers of hydrogen rapidly, exposing its white-hot, helium-burning core, according to a Gizmodo report. Wolf-Rayet stars have been found all over the place, so that’s not what makes it unique. But Wolf-Rayet stars are typically known for having twin lobes of gas that flow on opposite sides of the star, but with Nasty 1, astronomers are seeing a massive disk of gas orbiting the star — a strange phenomenon that suggests to scientists that there is an invisible, massive neighbor that is devouring Nasty 1. Astronomers found this by viewing the star through the Hubble Space Telescope, resulting in the theory of what is known as a “binary interaction.” This invisible celestial body is believed to be sucking in matter from the star and expelling it out, resulting in the giant disk. The lead author of the paper, Joe Mauehan of UC Berkeley, was quoted in the report as saying that Nasty 1 could be an extremely rare thing for astronomers to witness, as binary interactions happen over just 100,000 years, and the disk would be visible over just 10,000 years, making this an extremely lucky thing for astronomers to witness that could help inform future theories on Wolf-Rayet stars.